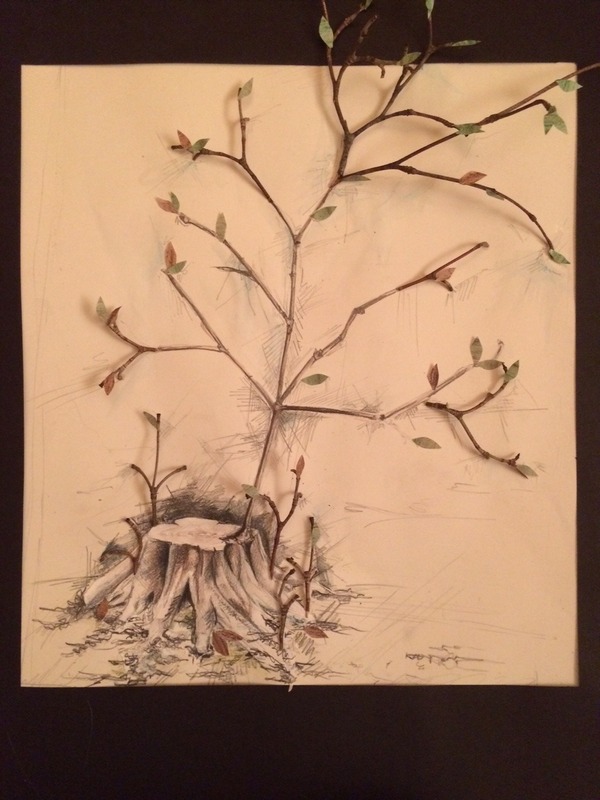 This image incorporates twigs from the artist’s family home. This was originally posted during Advent, 2015, when Riley was attending college in Virginia. 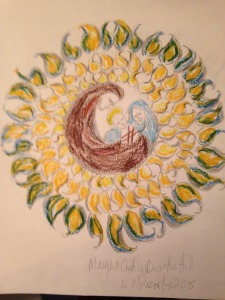 Offered by Riley Anderson, artist, seeker, child of God. Today the Word is made flesh. This Word that was in the beginning, that created all things, is now here in our midst as one of us. I love Eugene Peterson’s translation of John’s prologue in The Message: “The Word became flesh and blood and moved into the neighborhood…” and now the neighborhood, the world, the cosmos is changed forever. Merry Christmas indeed! I love equally the joy experienced by the shepherds who are the first team of missionaries making known to all their conversion experience. And I love Mary—she who treasured and pondered all that had happened and is happening. This Grand Miracle, as C.S. Lewis calls it, may be best expressed in a “Hymn on the Nativity” by Ephrem of Syria (c.306-373). and in her he became the Lamb, bleating as he came forth. but came forth having put on a lowly hue. there came forth from her he who clothes all. 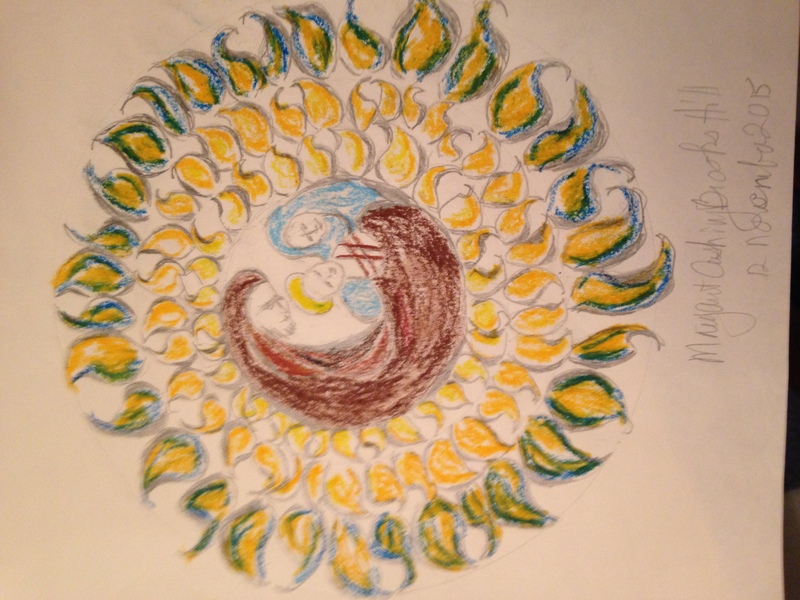 Holy Family artwork offered by Margaret Hill and words offered by Bill Albritton, companions seeking the Christ Child. there is joy, even joy, in the pain. it is through this pain that our salvation is born! they knelt down and they worshipped him. in the stillness of this moment the child comes—to us. Christ is born this night—come and worship. Offered by Jeff Jones, seeker of the Christ Child, child of God. 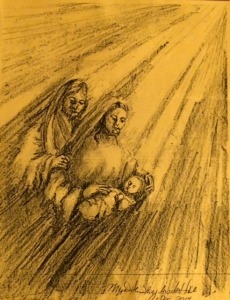 Artwork offered by Margaret Hill, drawer of the Holy, pray-er, child of God. None of us can imagine all of the private thoughts and questions of Mary, but I think of Mary’s expression of what she feels in her heart – namely, joy. She spends most of the time describing the way God is in general. Her spiritual beauty reaches its emotional peak in the first part of her song where she responds from the heart to all God did for her: My soul magnifies the Lord, and my spirit rejoices in God my Savior. Mary mentions what God has done specifically for her as an individual (verses 48 and 49). I am moved by Mary’s other-centeredness. She doesn’t look at her situation through the lens of her own personal situation. She displays a sense that she is the most privileged and most blessed person for her God given role, even though it would come at a great personal cost. 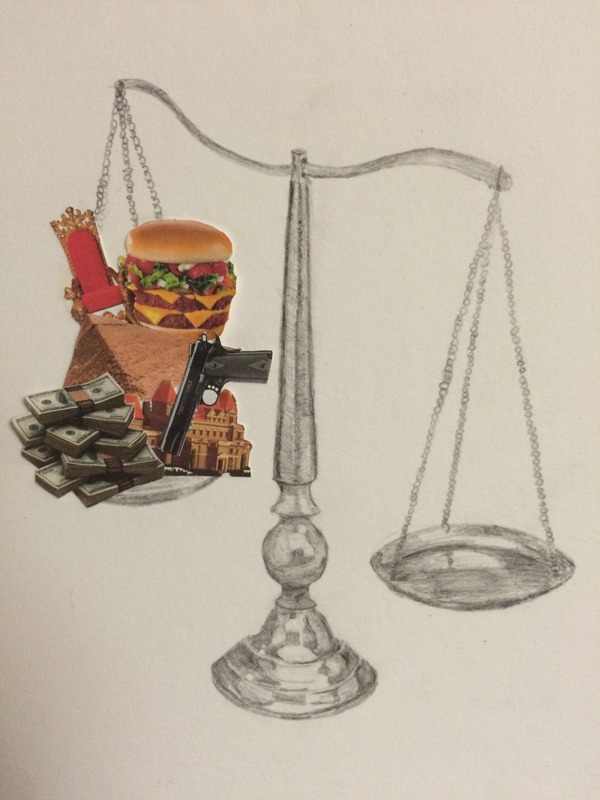 Would there be disgrace? Would she be an outcast? Would she be stoned? Would she be divorced? This is astounding coming from a teenage girl! I can’t help but ask: What and how did Mary at such a young age acquire such faith and trust? I am reminded and convicted of how important it is to a young person’s life to hear scripture read and to teach and live God’s word around them. Allow God’s word to soak into their hearts. I am so challenged by Mary’s level of complete other-centeredness. I consider the parallel between Mary and every Christian. Do you and I share in Mary’s joy? Offered by Donna Eby, worker for the needy, student of scripture, child of God. 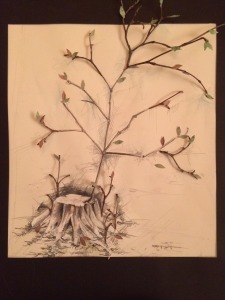 Offered by Colin Fredrickson, artist, high school senior, child of God. All things have been created through him and for him? The one who was with God from the beginning, who is God, is the one I’m walking to Bethlehem to see? Nothing is disconnected from him, and nothing is lost to him. Billions of stars and uncountable sub-atomic particles are joined together in him. All the creatures who ever were, all who are, and all who shall some day come to be, are related in him. No one is lost, abandoned, or forgotten. Everything is held by God, created for God’s delight. Perhaps God came to us as a baby so we might have the gift of holding him. And what about Mary – a lowly servant who sings of how the proud are scattered and the powerful are dethroned and the lowly lifted up? The Bible is replete with so-called insignificant places and people being exalted by God. It seems God’s standards of significance are quite different. When God emerges from the womb of an “insignificant” young woman to walk among us, heal us, feed us, save us, whom does this Jesus choose as his closest companions? Pretty much a bunch of insignificant people. As we celebrate the coming of our Lord this week, let us be reminded of True Significance, of what really matters (one definition of significant is the extent to which something matters). Born of a lowly servant in a one-horse town, in a stable with that horse and other insignificant animals, and worshipped by a group of lowly shepherds, we find the One who matters the most in our lives as Christians. The One who changed the world. Maybe we should reconsider our definition of insignificance as we welcome him into our hearts. And may we know our true significance in the heart of God this Christmas. Offered by Bill Albritton, prayer team leader, faith educator, child of God. There are few things more compelling than a baby’s tears. We adults are hard-wired to respond to them, so we get up in the middle of the night to nurse a hungry infant or change a wet diaper. We pace the floor with a colicky child on our shoulder, and we hold them when their crying has no obvious cause. We sing to them, even those of us who don’t sing. We do our best to console them, even when they will not be consoled. I’ve wondered lately if God came as an infant to show us that it’s okay to be loved, rocked to sleep, and held when afraid or sad. If Almighty God was okay with such nurturing, perhaps we can be, too. There’s a difference between being lost and exploring a new place without a clear idea of my current position. I’ve been both in Boston. If I stray off the ever popular Freedom Trail, with its line of bricks to guide me, I end up who knows where. With a bit of faith and luck, I’ve ended up eating a delicious meal in the North End, finding the Museum of Fine Arts by way of the Fens, and standing in Cambridge and Boston at the same time in the Museum of Science. I’ve also ended up on dead end streets lined with dumpsters, the Charles River Esplanade in plain sight and no way to get to it. Lost or exploring new territory? For me, the difference is mainly emotional. Lost feels anxious and not quite safe; exploring feels exciting and confident. But what if I walk in blindness? How would I know where I stood? How could I tell someone else how to find me? If my eyes cannot see, an unknown pathway means I am lost. Would I have the courage to walk such a path in the dark? Staying put or walking, I am afraid if I am alone. The same could be said for this journey that is my life. In times of blindness, I am afraid to walk and afraid to say put if I am alone. But I am not alone. I have a guide who loves me and brings me home. Not only that, this guide turns my blindness into light. No longer blind, held fast, brought home. Guide me, Lord, in life and in life beyond death. Amen. The temptation is to think that Christians have it made on this one. That somehow we’ve moved beyond the law to a relational faith based in Jesus. Because it is relational, we reason, it’s not about rules and regulations, but truly is a covenant written in our hearts. People are by their very nature, it seems, rule makers. So we good Christians who have been offered the gift of relationship with Jesus Christ have just as many rules, regulations and laws about faith as anyone else. Depending upon your theological orientation these “laws” are about prayers that need to be said, practices that need to be engaged, good deeds that need to be done, or beliefs that need to be held. These are what provide entre into the relationship or prove that the relationship is genuine. It’s all rational, cerebral and in almost all cases can be quantified. Even churches do it, keeping detailed accounts of the number of programs offered, pastoral visits made, baptisms perform, attendees in worship, and the size and growth of the budget. This, we assume, is a sign of faithfulness and provides assurance of God’s blessing. But it’s not about the heart. Faith based in the heart is relational in the truest sense. It is fostered in love and shows itself in love. It dismisses rules and quantifiable criteria and lets go of the need to prove anything to anyone. This is the relational love we celebrate in the Incarnation. And the truth is it is so foreign to the way the world operates, we need to take significant time to prepare ourselves to receive it. That’s what Advent is about. It is a time to let go of the law that governs our existing and embrace the love that give full, abundant and eternal living possible. This is the covenant that is within, the gift that is offered to us at Christmas. Offered by Jeff Jones, writer, teacher, pastor, child of God.